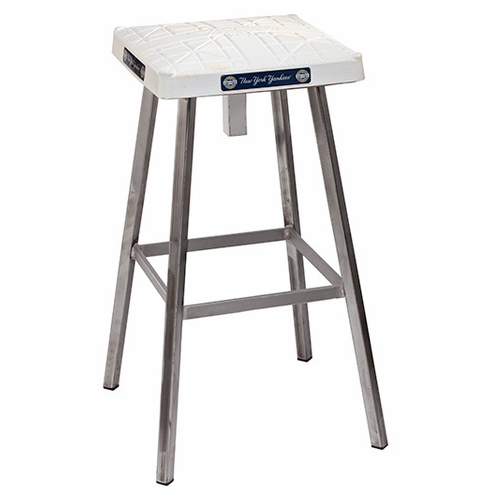 These MLB game-used base bar stools are hand crafted by metal artisan Erin Beales. Made from raw, industrial steel and cleverly designed so that your Game Used base can be lifted off so that you can do your own impersonation of Rickey Henderson. Sure to be a hit in your bar or office. Major League Baseball Authentication Program...each of these bases is authenticated under the auspices of the MLB Authentication Program and carries a uniquely numbered hologram that allows fans to verify their item at MLB.com. Stool frame is made of industrial steel, clear coat finish for scratch resistance. Bases measure 15" x 15". Overall height is appx. 31". Gift wrapping not available - please allow up to 4 weeks for shipping.